Add some summer freshness with a plate of scrumptious, juicy fruit. Sometimes that is all you need as an accompaniment to a nice grilled steak or burger. 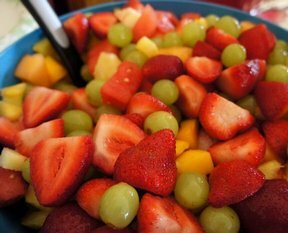 The nice thing about a plate of fresh fruit is that it makes a great addtion to most any meal. Clean all the seeds from the melons. Cut melons into chunks. Peel kiwi and cut crosswise into slices. Go through blueberries and discard blemished or damaged berries. Gently rinse with cold water and pat dry with a paper towel. 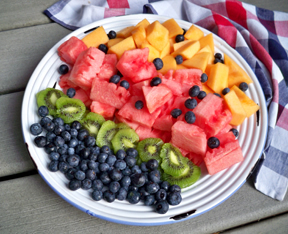 Arrange the different fruit on the plate in sections so that they remains separated. If desired, distribute a few blueberries throughout the plate for color contrast. If not ready to serve immediately, store in the refrigerator to keep chilled until ready to serve. When serving, refill plate as needed. "This is a great idea as side dish for a light meal. 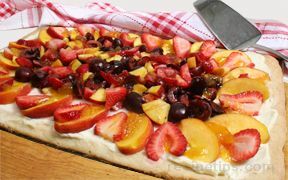 My husband and I are trying to eat a little lighter and this fruit plate would be perfect with a grilled steak or chicken breast."